The Blue Bermondsey BID, in partnership with local community organisations, are bringing a series of Easter holiday events for all the family to enjoy. Thanks to the support of United St Saviours Charity and Community Opportunity, Frog Morris bring three events for all to celebrate St George around the world. The Blue Bermondsey BID also partnered with Big Local Works and Poise Tennis Coaching to organise a fun tennis day. All events are free and there is not booking, just turn up and take part. Everyone is welcome to the free tennis fun day from midday at TheBlue Market. Whatever your skills or age, this is tennis for all in the heart of Bermondsey. No booking, just turn up, take a racket and have a go with the help of Poise Tennis Coaching. 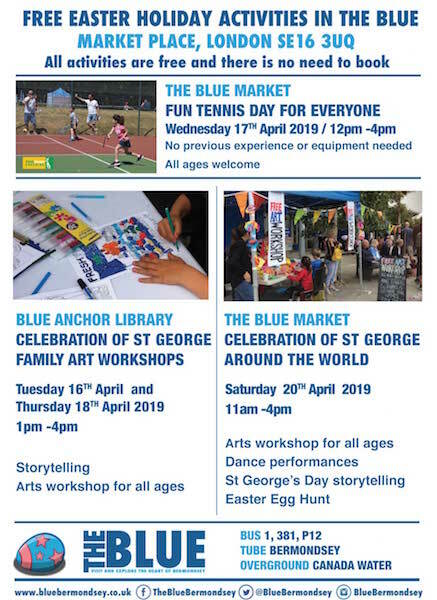 On this Saturday, the Easter Bunny and St George’s dragon get together in The Blue Market with many free activities for all. There will be arts workshops for all ages,an international dance display, the story of St George told by local school children, an Easter egg Hunt, and a crafts and family activities area.